The town of Potters Bar is in London's commuter belt and is an important regional hub for public transport. It's in Hertfordshire, and was historically in the county of Middlesex. Potters Bar claims eight churches and several schools and colleges, reflecting the diversity of the population. The town is also twinned with Franconville in France and Viernheim in Germany. As mainly a residential area, Potters Bar has a lot to offer. There's a golf club, a cricket club and a tennis club, as well as a bowls club for those who like their sports slower. The town's football team plays at Parkfield Stadium, which uses the turnstiles from the original Wembley Stadium. At the Furzefield Centre, there's a monster-themed Playzone for the kids. Families can watch from the seating area and grab a snack at Beaumonts Café. Behind the centre, King George's Field (named for King George V) is a large and popular recreation area. Wyllyotts Theatre is near the train station, and shows films as well as ballet and plays. The variety of food available in town ensures you'll never go hungry. Big chains such as Harvester have a presence here. There's even a theatre bar and café for pre-show dining, with Starbucks Coffee served. Most restaurants are along the main road through the centre of town. Alongside Indian and Chinese restaurants, there's Mediterranean food at Bistro the Walk and Greek cuisine from Tavernaki. From Potters Bar train station, there are direct routes into London King's Cross. It takes around 15 minutes to reach central London, and trains run to Cambridge and Peterborough in the other direction. For the London Underground, Cockfosters station on the Piccadilly line is roughly three miles away. The line goes through many of London's key tourist spots, such as Piccadilly Circus, Holborn, Green Park and Knightsbridge. The town isn't far from junction 24 of the M25. 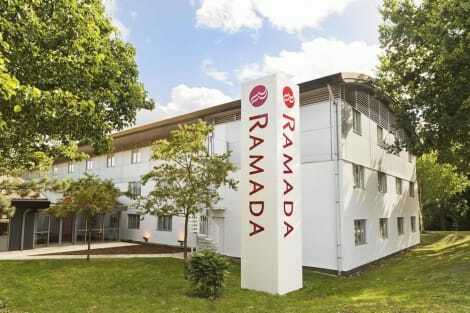 There are several Potters Bar hotels close to the motorway and the service station at South Mimms. Potters Bar is also on the Great North Road, the main link from London to the north of England.